Here’s another wiki that has made the news in the recent days. While WikiLeaks has definitely garnered a large following around the world, there are other wiki sites that are worth talking about as well. Just the other night, my friends and I were talking about Cuba – the way of life there, tourism, etc. I didn’t think I would be writing about a Wikipedia-style web site focusing on this Caribbean island. The web site is called EcuRed, and can be accessed at http://www.ecured.cu/. It is basically an online encyclopedia which aims to “spread knowledge from a decolonizing, objective, and truthful point of view.” Unsurprisingly, the site received a massive amount of traffic, and due to this, it went down earlier this week. It’s been up since then, though, and visitors can read the articles – all 19,752 of them. 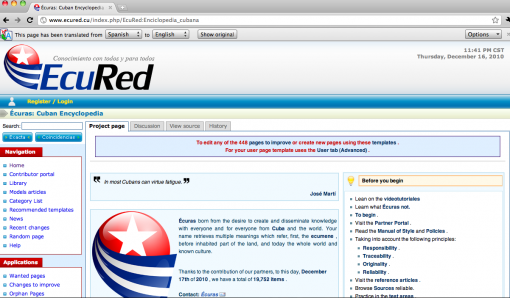 The whole site is in Spanish and is dependent on a government-run network. There are about 600 computer centers involved in the project as well as more than 1000 content developers. I do not speak or read Spanish, but thanks to Google Chrome’s translation feature, I was able to browse the web site. Écuras is optimized for best viewing in the browser Mozilla Firefox , you can download by clicking here . We also put at your disposal a spell checker that integrates with Firefox to verify your spelling, install it by clicking here . If you have connectivity problems downloading the offline editor . It is imperative that before you begin, read What is Écuras . Learn to appoint either an article with the title Conventions . You can ask questions and provide knowledge on the corner of the FAQ . There are models of articles that offer guidance on the structure of a particular item. Look at this list of recommended templates . That list was translated automatically so there might be some grammatical inconsistencies, but you get the picture. What’s important, I think, is that it is a huge step towards Cuba’s opening up to the world. Something to be excited about, don’t you think?